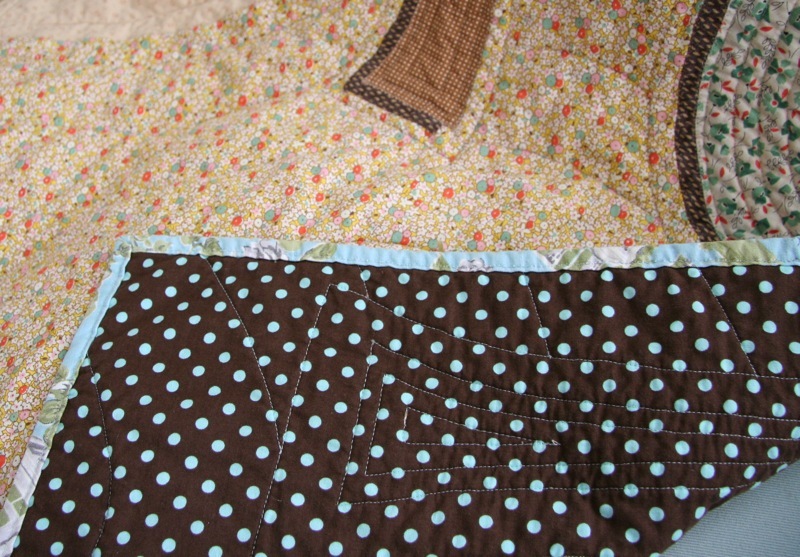 I finished up that baby quilt I was working on this morning and it just came out of the dryer all nice and crinkly. In the end I decided to forgo the tying and french knots plan. I kept trying it, different colors, different yarns and it just wasn’t working. It wasn’t nearly as dramatic as I’d envisioned and it made the quilt too folky instead of the more modern look I was going for. I moved the trees around some too. I really like how they are running off the page now. For the binding I used a vintage scenic linen towel. It was a labor of love because although it was big for a towel it was still a smallish square and I had to piece together about ten small strips to make the binding. It was worth it though. I’m very happy with the blue sky border. Now I’m ready to get another quilt up on the felt wall. Something about quilts, no matter how much time they take to finish as soon as it comes out of the dryer I feel ready to jump into a new one. WOW, that quilt is GORGEOUS!!!!! Wow. I am dumbstruck. It is totally amazing. You should be so pleased with yourself. If I made this I would be smiling for a whole year! Looks wonderful – what a lucky baby! Absolutely gorgeous. I’m really interested in getting into quilting and I keep seeing these absolutely beautiful, unexpected quilts – now I just need to figure out how to make one myself!! Very artisitic! I’m inspired to go and create an original quilt design. Wow! It came out amazing. I love how you shifted them so they run off the quilt. Brilliant as always Hillary. Just gorgeous. I love that the trees are falling off and upside down… just like life! What fun you must have had placing these on the wall. fantastic! i *love* the shadowing of the trees, and such lovely machine quilting. did you applique, or piece? just beautiful. This is so gorgeous!! The colors are so soothing and earthy. I love that! This baby will have many a warm, cuddley, dreamy night with this beautiful quilt! Love the quilt! I could see it anywhere in a home, from living room to a child’s room. Fantastic! That is no average “baby quilt”.. lovely! Beautiful and playful! Just love it to pieces! I don’t know if I’m more impressed with your fantastic sense of balance with the trees, or the perfect machine quilting. Every time I try to machine quilt, well, let’s just say it doesn’t look like that! Very very very very very lovely. Very nice. Great choice of colors and I too like that the trees are going off the edge. I’ve never done a quilt before so sorry if this sounds stupid, but why to you put them in the dryer after they are done? Is it just something you enjoy doing or part of the making? Seriously. I am always impressed by your machine quilting! I love the quilt and the amount of stuff you get done, I am so impressed! I am a little afraid of patterns, but I must say you always make them seem to work together! Thanks for encouraging trying something new. What do you use for batting? I love how your quilt “falls” and folds. i particularly love the fabric at the top of the top photo. where is it from? It looks so pretty! Is it for your new niece? I can hardly wait to see the next project. Absolutely beautiful, Hillary. You rock!! Gorgeous! I just love it! And I know what you mean – I always have a quilt in progress (or 2 or 3 . . . ). That is a seriously stunning quilt! I’ve been so looking forward to seeing this finished and it is even better than I had imagined. That’s one lucky babe! I love your round trees – the whole thing isperfect. that worked out beautifully! i love the quilting – really emphasizes the shapes! really so amazingly beautiful…i’m inspired and jealous! so lovely! 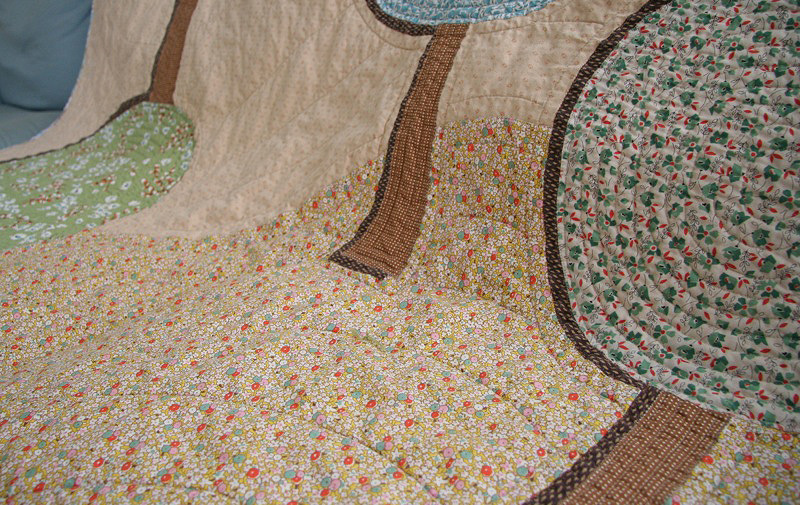 I love how you’ve used the quilting to give the trees their “texture”. And it’s true…..as soon as you’ve put the one you’ve just finished into the dryer…you’re already half into the next one. that’s the trouble with having a fabric stash *and* a crafty mind. 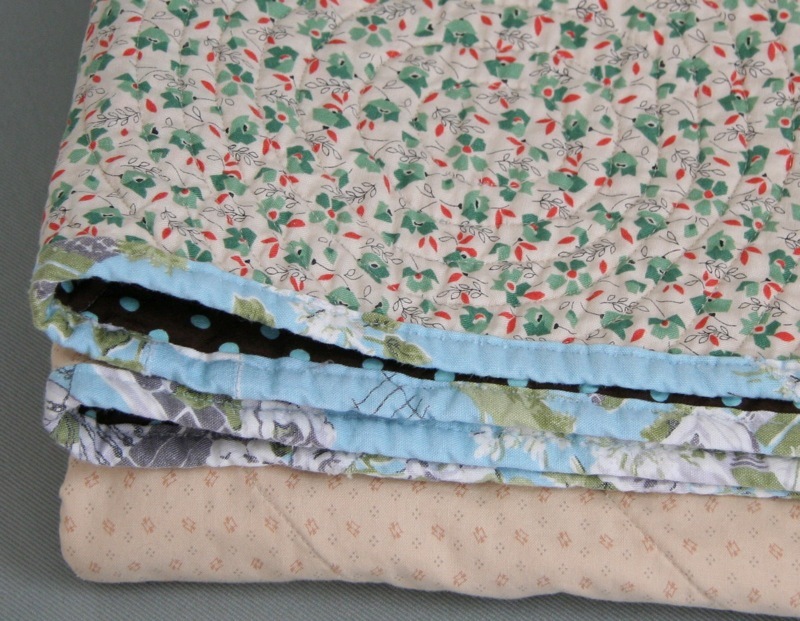 Excellent quilting, and a perfect binding! The design is a winner. Fab-U-lous! Modern and still so sweet. The trees remind me of the illustration at loloko.com. Lollipop trees are things of dreams. Good work! What more can I add – this is so beautiful, an absolute work of art. I’ve been dying to see it complete since you posted the first layout a while ago. I was wondering on a technical note – do you applique the trees on to the background or are they pieced in? I have only done really simple quilting so far, but I use applique for hard bits. I am keen to know if this is what you have done. Amazing!! You’re making me want to pick up quilting. oh how beautiful!!! all your fabrics make me wanna find it but in paper!!!! i love your trees, and your quilt style is very professional, clean, and again, pretty! and the LORAX quote just made me GRIN! absolutely lovely, your talent amazes me once again! oh hillary, it is stunning! the round trees are beautiful and i love the quilting too. the binding is perfect! bravo you! Wow! This is awesome! When I saw your idea for the quilt I thought it would be a small wall piece, but I LOVE it big. WOW! I feel the thneed to make a quilt now. hilary: did you know that today (the day of your post) is Dr. Seuss’s birthday? I’m assuming you had a Lorax reference going on with your post title . . . hooray for trees! (and your creations). Gorgeous! I want to make a queen size one for me and my hubby to be! Hi Hillary- that’s beautiful work! I love how the trees have slight shadows- it really gives the quilt depth and shape. I love it I love it I love it! Excellent work and fabric choices. Beautiful!~ i love checking your site to see what creative thing you are up to ~i am always so inspired! (i found your site a couple months ago)thansk for sharing! Why am I always amazed at your posts? I should get used to the fact that you are a genius. I love everything about your trees baby quilt. Another masterpiece. Really. Well done and bravo. I agree with you about the tying off. It’s a very cool quilt. And the border is perfect! man! it turned out amazing!! really loevely. what a gift. Gorgeous! You did a fantastic job. The trees are great. So pretty! I have such admiration for quilters… I’m not at a point in my crafting life where I have that kind of patience! You are so talented. I really enjoy this blog & thrift craft which I just recently discovered. That is beautiful, I love the trees and the hills and everything about it. I think I have room in the new shop / studio for a felt wall, that makes me really excited! I love how it looks crinkly…it gives a completely different look to it. The colors are nice and it’s not the typical baby quilt, that makes it special. I hand quilt always so I never get that same look, I guess I don’t have so much patience to do so much quilting…really enjoy reading your blog! you are very inspiring! So incredible! I love the way you used that dark fabric to give depth to the trees. Beautiful colors. Very lucky babe! Beautiful! I’ve been back quite a few times to admire. Love everything about it especially the quilting on the trees. I would also like to know the technique you used. It is so nice! Did you applique the trees? Or are they pieced? And as a new quilter, I haven’t heard about the dryer thing. You throw your quilt in there when it is done? no that you need another comment (hee hee!) but i just wanted to say, amen! to all the previous adorations and tell you i think its just lovely! love love LOVE it! and the more and more it’s washed and used the even better it’ll become, if that is possible. enjoy your beautiful work!!!!!! Very inspiring. It would make a lovely wall hanging when the baby grows too big for it. WOW! This quilt is awesome! I feel exactly the same way about quilts. The moment I am done (even if I griped my way through) I am ready to start another. And I just keep looking and looking at the finished one, loving it. They get into you, don’t they? I love it! So modern and sweet. Lucky baby. so, the answers, yes, I appliqued it. folded the edges down and zigzag’d them down. oh and the dryer thing, washing and drying the quilt after it’s finished crinkles it up (hopefully!). I have to say I appreciate your willingness to share your crafty life with us. 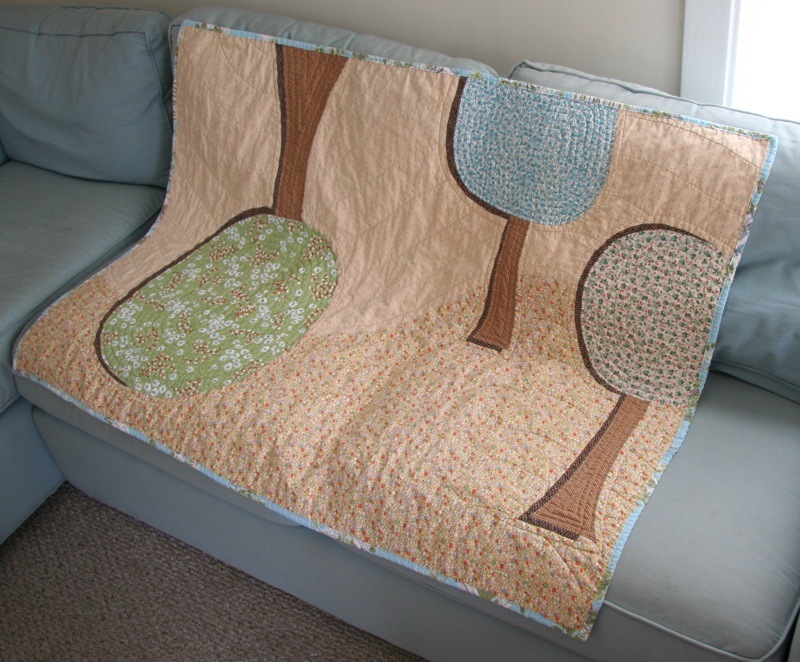 I enjoy looking at this quilt…especially the trees! I love it! What a unique baby quilt! That is amazing! Really awesome work! Oh my! This is possibly THE most beautiful baby quilt EVAH! LOVELOVELOVE it! Well done! I’m so inspired to make more quilts and combine various prints and patterns. And this tree quilt – just beautiful. It is so different – i love it. I’ve never seen anything like it. so amazing, love that quilt, so modern and i think baby gifts are more for the mom’s taste anyway as the baby doesn’t really care, do they…they will love it and have such an amazing original piece of artwork! Another comment?? Well, it is so beautiful I just had to. That is a lot of effort for a baby quilt and I know it will be treasured forever. Ditto on the desire to start a new project. Mine usually begin the second I get the top of the previous put together — not even quilted or bound yet. wow, so many comments but it’s true it’s gorgeous. and you must have the patience of an angel. I wonder how many people will make their first quilt because of this one. Congratulations again! this quilt is incredible. so inspiring and i love the border fabric. so so lovely!! WOW, I LOVE that quilt – it is stunning! I LOVE your work. What amazing talent! I’d really love to know what kind of sewing machine you use on your quilting and if you use a walking foot or some other foot for your machine quilting. Thanks!! I love making baby quilts, but this one has inspired me to abandon the more traditional (mostly boring ’cause I’m no good with patterns) route and expand into something original. It’s such a fresh design, simple and yet interesting. So, I’m thinking of a landscape too, but something more out of Dr. Suess land. Picked up a couple of shirts in the second hand store too that I normally wouldn’t have even noticed, but their unique color and design jumped out at me. Thanks Hillary for the inspiration. I love your quilt. It’s so simple in design and amazingly effective. I just have to jump in too. Everything about that quilt is wonderful. I’m really not a sewer, even though I’ve started to buy fabric lately, and this inspires me so. I would love to understand how your creative brain works- this quilt is brilliant, as is all of your crafty art.